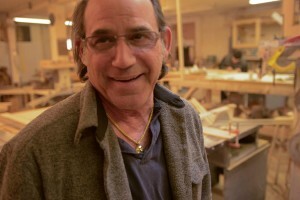 Marty, owner of Goldleaf Framemakers, has been well known in the gilding industry for many years. His book “An Introduction to Water Gilding” has become the bible for gilders internationally. His gilding courses at the major industry trade shows are consistently sold out, and he continues to develop and refine his craft. Marty’s interest in picture frames began at an early age. He was 13 when he began making picture frames for 50 cents an hour in a small shop on Long Island, New York. Shop owners Hy and Lee Packman nurtured Marty’s interest in both art and framemaking. Their influence led him to enroll at The School of Visual Arts in New York City in 1967, where he met and studied with gilding maestro Henry Rothman. Under Rothman’s tutelage, Marty not only began to learn the fine art of water gilding and picture frame patination, but also the importance of historically and artistically accurate picture framing. Upon graduation from The School of Visual Arts in 1970, Marty joined Kulicke Picture Frames, at that time the largest and most respected custom framemaker in the industry. Working at their factory in Greenwich Village, New York, he was able to fine-tune both his gilding technique and his sense of design. Marty showed a remarkable ability to design the correct package: the marriage of art and frame resulting in a finished product that is more than the sum of its parts. In late 1973, Marty moved to Frames Unlimited, the fastest growing manufacturer of picture frames in the country at that time. From their headquarters in Soho, New York, Marty served as General Manager and Vice President of Sales, handling numerous Madison Avenue galleries, private collections, and the biggest corporate accounts in the United States. In 1976, Marty went to work for the Sam Flax Corporation, owners of 4 Manhattan art supply and picture framing stores. Marty reorganized the entire picture framing operation, creating the prototype of picture framing departments in craft and art supply stores as we know them today. Marty rejoined his mentor Henry Rothman in 1980, when they formed Rothman and Horowitz, Master Framemakers. Operating out of a refurbished Manhattan frameshop, Marty spent the next 6 years framing for galleries, contract accounts, and museums. Although he enjoyed the creative work and collaboration with Henry Rothman, Marty developed allergies to some of the framemaking materials. These environmental sensitivities, coupled with the demands of supervising two shifts of workers each day, forced Marty to leave hands-on framemaking. Jake Munn offered Marty the position of New York City Sales Representative for Abe Munn Picture Frames. Many of Marty’s clients from Rothman and Horowitz followed him to Munn, where he developed new accounts and continued to serve existing galleries and individuals. Marty added teaching to his resume in the early 1980s. When he was learning water gilding, Marty found few reliable references. He learned by watching other gilders, consulting outdated art manuals, and trial and error. He decided that if he ever had the opportunity, he would share his knowledge so that other would-be gilders wouldn’t have to go through the same difficulties. This led to his popular classes, given at national trade shows and exhibitions produced by Picture Framing magazine, the Society of Gilders, and the Professional Picture Framers Association, the book, An Introduction to Water Gilding (PFM PubCo., 1998), and numerous articles in trade publications coast to coast. In 1988, continuing health concerns led Marty to seek a healthier, less-stressful location for his career. He relocated to Santa Fe, New Mexico, where he could return to his first love and true passion, hand-carved, gold leaf picture frames. Goldleaf Framemakers of Santa Fe is the culmination of Marty’s 35 years in the industry. It brings together the best of period frames, from hand-carved Taos School and Spanish Colonial to American Impressionist and other styles. As if being a master framemaker weren’t enough, Marty is also an artist. His gilded art objects have been shown at galleries and museums in New York, Santa Fe, Wyoming, Memphis and Scottsdale. His show, Horowitz 2002, was a great success, and led to commissions from art consultants in Arizona and Colorado. He is represented by Linda Durham Contemporary Art in Santa Fe.